Parking lot and trailhead are located on Tripoli Road in Livermore, NH. Tripoli Road is best accessed from Rt. 49 in Waterville Valley. It is 10.2 miles north of Rt. 93 at exit 28. Follow the signs for Waterville Valley Ski Area but bear right at the entrance to stay on Tripoli Road. The large parking lot is on the right, 4.5 miles from Rt. 49 and just after the road turns to dirt. Mt. 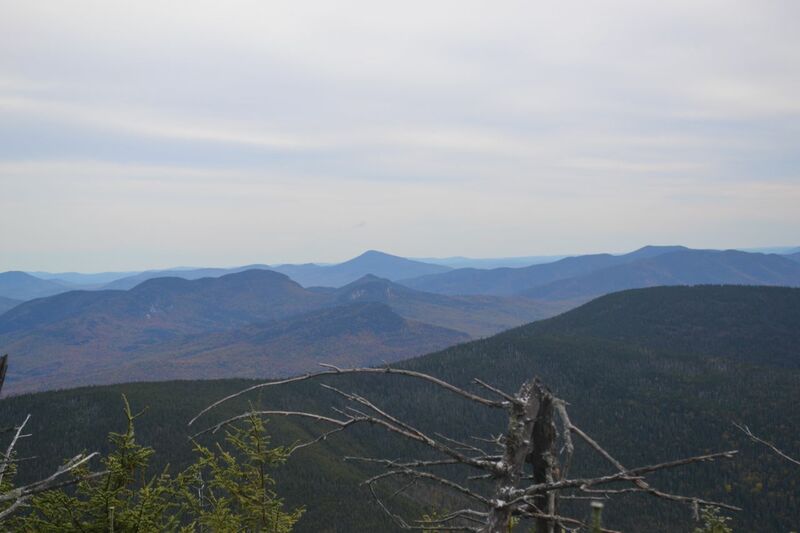 Osceola is considered one of the easiest New Hampshire 4000-footers to hike. The trail is rocky, but not too steep, and the reward is excellent. East Osceola has a bad reputation among 4000-footer climbers as being a boring, viewless mountain. For this reason, it is usually only ascended by pursuers of that list. However, that is simply untrue. East Osceola has two spectacular viewpoints near its summit, both in different directions. It is a fine destination for any hiker who has the energy to get there. The trail begins in Thornton Gap, the pass between Mt. Osceola and Mt. Tecumseh. Head to the far end of the parking area and begin hiking on the Mt. Osceola Trail. The unusually rocky trail climbs slowly upward across the slope, crossing several small streams. After a while, the trail turns left, goes through a few switchbacks, then heads toward the top of Breadtray Ridge. The trail reaches the ridge top at about 1.5 miles. From this area, the summit may be glimpsed through the trees. The trail briefly runs flat, with one minor descent, then continues climbing. In just over half a mile, the trail crosses a cascading brook and soon begins switchbacks. In some sections, there are angled rock slabs on the trail which can be very slippery. Limited views can be had from the highest switchbacks. Near the top, the trail abandons the switchbacks and heads straight uphill at a more gradual grade. The summit, marked by fire tower footings, is reached at 3.2 miles from the parking area. Here, a side path on the left leads to a protruding rock which yields a directional view over the Pemigewasset Wilderness. The trail continues a few hundred yards out to Osceola's viewpoint ledge and the site of its most recent fire tower. The directional view looks east, directly over Waterville Valley. To the north, you can see Mt. Washington over Mts. Hancock and Carrigain. Further to the east is the Carter-Moriah Range and the smaller ranges near North Conway. Next over, and very close, is East Osceola, with the long ridge of Mt. Kancamagus behind. In the center of the view, over the valley, are the Tripyramids. Continuing over to the south, the Osipees are seen in the distance, with Sandwich Dome closer by and to the south. All the way to the right, you can see the ski trails on Mt. Tecumseh. From the northeast corner of the ledge, the trail descends quickly, passing views north through the trees. It becomes very steep in places, but flat in others. Soon, it emerges in a rocky area with wide views over Waterville Valley and ahead to East Osceola. The trail then makes a dangerously steep descent through a walled-in scramble known as "The Chimney". Fortunately, a herd path leads around the left side of The Chimney for an easier (but still very steep) climb down. Just below the Chimney, at 0.6 miles from Mt. Osceola, the trail crosses the col between the Osceolas and begins to climb. After a moderate 0.2 mile ascent, it reaches a trailside rock which provides a very good view of the Pemigewasset Wilderness. To the far left, you can look back to Mt. Osceola. To the northwest is the Kinsman Range; next over is the much higher Franconia Range. In the center of the view is Owl's Head Mountain with Mt. Garfield above. Further to the northeast is the Twin Range, and all the way to the right is Mt. Hancock. This rock is the best viewpoint on East Osceola. You will want to spend some time here, although there is not much room on the ledge. Another 0.2 miles of climbing gets you to the wooded summit. Pass the large cairn and head out to a blowdown patch on the right for the second view. This view looks east. To the far left is bumpy Mt. Tremont, with triangular Mt. Kearsarge North behind Owl's Cliff. Further south are the Moats, behind Bear Mountain. In the foreground is the long, low Mt. Kancamagus. In the center of the view is rocky Mt. Chocorua. To the southeast are Mt. Passaconaway and the Tripyramids.